If it has a Unit Constructed Engine it is a 2009 model or newer. If it has a five-speed transmission, it is a 2004 model or newer. If it has an electric starter, it is a 2002 model or newer. If it has four wires coming from the alternator it was made after June, 1999. If it has three wires coming from the alternator it was made before June, 1999. If it has a yellow horn button it was made after June, 1999. If it has a red horn button it was made before June, 1999. Easiest of all, the year and month of manufacture is stamped into the plate riveted to the front down-tube of Royal Enfields imported into the U.S. since 1995. You'll also find the VIN number stamped on a plate inside the right-side toolbox. 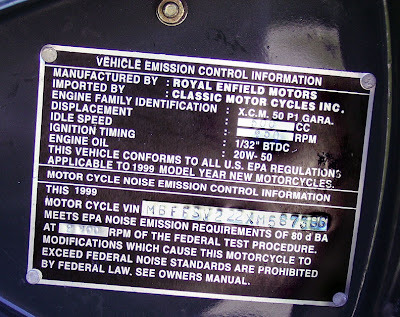 The plate inside my right-side toolbox (top) helpfully gives the model year of the motorcycle and a quaint warning against modifying it to make it louder. NOTE: This article deals in a general fashion with Royal Enfield Bullets made in India for the U.S. market. If your Royal Enfield is not one of those, or these tips don't seem to help, there is another article, at this link that may help you. this is Shree from India...! how to know about models constructed before 1995...???? i'm very intrested in knowing it...!!! That is a complex question and I have no experience with it since I am in the U.S. and we didn't have regular imports of made-in-India Enfields until 1995. I am sorry I can not help. Hi David, I have an 2007 iron barrel 5 speed/ electric start. All the info I can find does not include 2007 model years. Why is this? Economic downturn at that time? Same as the 2006 model? Canyou shed soem light? It is an interesting question. Something must have made an exception of that year. Perhaps a lack of significant change, as you suggest. I will try to find out and update. On the gooseneck of my bike is stamped (F1223) on the block (1B1223 & BG257).. I don't have a title for it yet any information would be much appreciated thank you..Bopper Minton.. There is another article you need to read at this link that should help you. You need to check my other article, Here's How to Tell the Age of Your Royal Enfield. Follow the directions there.